In today’s blog I am going to look at some of the interesting places that I have been to this year that has inspired me. I am also going look at some of the challenges in my business & life I have had and how I have counteracted them this year. I have also been using some great mantras and other techniques that have been working for me so I thought that I would share them with you. One of the biggest challenges I had last year was taking good photographs of my products. I am a designer and maker and my forte is not photography. However I soon learned that to run a successful business meant I had to get good at everything or if not hire someone else to do it. I am one of those people that will give it my all before considering the latter. After sending off for a photography light box that didn’t work I became well known in my house hold for either running outside to capture products in ideal lighting or hanging out of my windows. I have been reading that there is a lot of crafting businesses that have been doing the same so if you are a small business this may resonate with you. I have tried all different kinds of back grounds and was partial towards the white ones but I could never get rid of that blue tinge even after adjusting my white balance. Deep down I knew that this was true so today I took his advice and took some more pictures using my wooden window sill. I have had fantastic feedback so far and I must admit I am very happy with them too. Challenges always make us grow stronger and it is our passion we always find a way. One of my new challenges this year is to learn how to style my products so I can make them look more interesting to look at it. I will keep you posted on how this goes. One of the other challenges I had last year was that I was so busy working that I hardly got chance to do more of the other stuff that I love. So my new years intention was to make more time to enjoy the outdoors. So on New years Eve I wrote a big long to do list – one of them was to meditate more. This practice quietens the mind, replenishes the body, mind and soul. I have been practicing it every day this year with noticeable results two of them being more energy and more clarity of thought. As we moved into another year I am proud to say my to do list has worked. It motivated me and I have five tasks already ticked off. I find that to do lists gives me direction and I get things done. No to-do lists and I have a habit of meandering through life. That is okay if I want to be spontaneous and have some outdoor adventures as its sometimes-fun not knowing where your going to end up. However it’s not ideal I have discovered when running a business, organizing an event or some other big goal. ‘All I do is have fun and have outdoor adventures’. It is almost as if times responds to what we are saying as this year these mantra has worked and I got to start the year off with more time to relax, socialize, get creative and have some outdoor adventures. To combat the tiredness I also started using some aromatherapy oils. I found a wonderful small business who customized an aromatherapy roll on for me that I could roll onto my pulse points. I chose grapefruit as it is stimulating and argon oil which is moisturizing. I loved the fact that it was all customized for me and the service was marvelous. You can find her range of products here. To also combat the tiredness I decided to get out into the fresh air more and leave work behind me. And that meant not carrying it with me. This weekend I went hiking on the moorlands. I happen to live in an area that has a very diverse terrain from woods to forest hills to mountains and moorlands. it is a place that i am eternally grateful to live in. So when my daughter said do you fancy a walk today she didn’t need to ask twice. I was determined to make time for myself this year so we set off and after a twenty minute walk past lush countryside and forests we arrived on the moors. The Earth Faeries like to travel. We have wander lust at the moment so we headed to moorlands in Wales for a micro adventure. In the summer months there are thousands of miles of heather all in full bloom with lilac and pink flowers on. But at this time of year the plants are more of a copper hue and stretch for miles There is an old watch tower on there that every time we go there we never seem to reach it through one reason or another. Word of caution when walking on moorlands or mountains the weather can change very quickly so one has to keep a look out on the sky. We left the main path and took a different route that my daughter had plotted out on her map before we left. Our dog bounded through the heather looking more like Bambi than a Labrador and we jumped over numerous bogs. And as we reached the top of the path I noticed the mist had started to creep in and I decided that it was a good time to go back. We quickly walked along the moors so we could gain access onto the main natural path that would lead us off it. We could see the mist starting to circles us and it was one of those adrenaline moments. With no time to spare we picked up our pace. Dense fog closed in on The Earth Faeries. We had phones with us but there was no signal up there and the moorlands are not a place you want to be in once the mist descends. Reluctantly we got off there in time. As we looked back over what was once a moorland of orange hue was just a blanket of dense mist with no visibility. We arrived back at our house to find a package that our friend had left us on the doorstep – about three dozen home cooked Oaties. She knows I am vegan so had kindly made them with no dairy products in. We sat munching them over a cup of tea reminiscing about our adventures. It was nice way to end the day. The following day we decided to go to Llangollen and do some hill walking. I live up in the hills and the nearest village is 3 miles a way. Normally we have a car to get out and about but this day we didn’t so it was 40 minute trek down steep country lanes to catch the bus from the village bus stop. It made a nice change and the route was scenic – past hills, rivers and farm lands and was all part of the adventure. Some times it is nice to push yourself out of your comfort zone and do something different. The hill we visited is called Castell Dinas Bran meaning fortress of crows. Yes it lives up to its name as there was lots of beautiful crows there and that made it quite mystical and magical. The hill was situated just slightly outside of Llangollen town. It’s not as rural or wild as I am used too and is more of a tourist attraction than a path through the wilderness. However it was fun to do something different and there were views of mountains in the wilderness that we could see from the top of the hill which we are planning on exploring soon. As we walked up the path lots of the crows flew over our heads and you could see them circling the ruins of the castle. My imagination started to run away with me and I had some great ideas for my faerie stories that I write on here. I could imagine my faerie characters riding on the backs of these beautiful mystical creatures. The walk was fairly steep and you would need a moderate level of fitness to get up there. However there is benches on the way up that we did sit on to take in the breath taking views. In one direction there was rolling hills and in another quarry type cliffs. The hill we were walking up had sheep roaming freely on and as we got to the top a crowd of these woolly fellows moved quickly as they spotted our Labrador who was on a lead I may add. The wind was strong on the top of the castle and I could understand why my daughter had told me to put my hood up. It was quite a challenge to hold my phone camera still to get some pictures but I managed to get some for you all. The energy was very different to where I live where the odd tractor goes by and the occasional hikers and mountain bikers. The path was well worn by tourists and you could catch a glimpse of the town below so although not as rural as what I am used to it does have a nice contrast of yin and yang. We wandered past run down walls that were dotted around the top of the hill. The castle had been build in 1260 by a Welsh Prince. We walked around small paths that circled around the ruins. Stunning panoramic views of the lush hilly and cliff terrain greeted you at every turn. We had chosen this time of year when there wasn’t a lot of tourists there so was only a handful of people up there. I am not one for crowded places so was happy I almost had it all to myself. Afterwards we chose a less steep path that led us back down and past this beautiful wood carving. Back in the town again which was about a five minutes walk from the hill we past a canal with paddle boarders on. It brought back memories of my paddle boarding adventure two summers ago. We had paddle boarded along the Llangollen canal before popping in for lunch in this cafe in our wet suits in a small canal cafe. The climb had given us an appetite so we headed to a pet friendly cafe popular with kayackers. My daughter kindly bought me lunch whilst our dog sat next to the cafes owners dog. A beautiful gentle Alsatian by the name of Skye that she has known since they were puppies.They bonded well as they nuzzled each other as we had our bite to eat. After a falafel burger with hummus on and a latte with soy mill (they cater for vegans) we headed down to the river to sit and watch the kayackers tackling the river rapids. My daughters’ partner is training to be a kayacking and paddle boarding coach so we thought that it may have been him as he was there on his course that day. However it turned out it wasn’t. We sat on concrete steps watching a kayacker tackle the rapids and go side on to navigate the fast moving water. I silently cheered as he got through the rapids. I even managed to get a picture of these three ducks whilst our dog went for a paddle in the calmer part of the water. She was definitely a swimmer in another life as give her water and all you hear is splash. She is the only dog I know that swims like a human. Pubs are not my favorite place as I don’t drink but some times when it’s cold outside it is nice to go into somewhere warm. And the corn mill was a quaint country pub that didn’t feel like a pub at all. It is set besides the river rapids and you can eat outside and watch the steam train opposite or watch the adventurers white water rafting which is a sight to behold. It also has a huge non working water mill that is fenced off by a cage but is a spectacular sight. And we went in there for a drink of non alcoholic ginger beer which I have never tasted before until then. It was delicious and has inspired me to make my own. I also got to go out onto the balcony and take some pictures of the river. We arrived back in the village before dark but as we began to walk up the country lanes the darkness crept in. Thankfully we had brought a head torch so we had good visibility. There was no stars in the sky that evening as normally I entertain myself by spotting the constellations. The only light was from our head torch and the reflective stickers on the field posts. After a 40 minute walk in the sleet we arrived back feeling like we had had a good exercise and already planning our next adventure. My mantras are working as I have just been for an hours walk this evening with my pet dog despite torrential down pour and hail stones. And I am feeling full of energy and I am having more time to do more of the activities I love so I will keep saying these. Look at all your options and take some time to explore them. Keep open to the universe as she always sends you new options and often knows the easiest way. Meditate each day to replenish yourself. When the mind is rested the body follows suit. If something isn’t working then try another approach. Practice makes perfect. It is how we all learned how walk. Go easy on yourself when learning new habits, skills etc. Good habits can be cultivated with practice and patience. Get your mindset on board and enlist the help of supportive mantras and people too. Make sure that your thoughts are pulling in same direction as what you want to achieve. The key is congruence here. Put to do lists together and follow through. You can see how much progress you are making then and it is sure to motivate you. Reach for holistic remedies as they support the immune system naturally and many have been round for thousands of years and are tried and tested. Put the fun back into what you are doing. If there is no fun there then what is the point of doing it. If there is no fun in what you are doing maybe make it more fun or use it as a sign to go along another path which will make you happier. As my friend puts it ‘Help others to rise’ Whether that’s sharing our knowledge or skills or whatever it may be it is a fact that helping others to get what they want helps us too. As when we help others we always receive help in return and our path becomes smoother and the challenges start melting away. Has anyone had any challenges with their business or other goals? And if so how did you counteract them so you stay on track? What It Means To Me To Be A Sustainable Business. In this blog I’m going to talk about why I decided to rebrand and become a cruelty free business. But also to tell you about why a rebrand can take so long and why it is not an overnight solution. Rome wasn’t built in a day. And this metaphor can be applied to everything in life. Indeed it applies to my own business. I started out making authentic pearl jewellery, and for ethical reasons decided to make my entire range cruelty free to reflect myself and my brand. That meant my brand going vegan and myself! This meant a total rebrand of my business which is still a work in progress. It is surprising how many people I have spoken to who told me that they make sure that they source out cruelty free clothes and house hold items etc but have never considered that this applies to jewellery. And this applied to me too. My research left me stunned and I thought that I would use my blog to educate others. It hasn’t been an easy task sourcing out cruelty free supplies as I have had to source out new manufacturers and new materials. Some of them replied promptly whilst others never replied so the search went on to find good quality materials that were ethically sourced and cruelty free. Lots of the professional pictures I had taken when I first started out making my jewellery had the old products featured in them i.e pearls so were no longer suitable. ( I will tell you more about why later). The hardest part was taking the pictures of my jewellery off my blog and website as hours of work, creativity and love had gone into the wedding shoots that had brought together a photographer, event organizer, hair stylish, make up artist, bouquet maker, a model and obviously myself who had designed the jewellery. I will admit I was a little disheartened at having to go back to basics, new materials, new suppliers and new photographs. It seemed such a big task but well worth it because it’s important for my business to reflect my ethics. To make the whole process easier I broke the goal down into small components and began tackling each one. I had to source out animal free glues, animal free clay’s, and faux pearls. I soon discovered and to my surprise that even faux pearls weren’t all cruelty free. All faux means is fake so beware of this when your shopping for your jewellery. It was a costly mistake I made as after ordering some beautiful faux pearls in a vast array of colours I began to question how they had got the beautiful colours of their faux pearls. It was a good question and sent me on a quest to enlighten myself. I soon learned some faux pearls have animal by products in. It was big learning curve! Thankfully I hadn’t sold any as I was just in the middle of making the new product line with them. I contacted the supplier and she told me that she wasn’t too sure what the colours were made of but would contact the manufactures. That supplier never replied back to me so those faux pearls ended up in my draw never to be used. However I learned a lot from this experience and it helped me improve my customer service by making sure I always kept in touch with my customers each step of the way. Exactly the same applied to my ribbons. I had to go and find suppliers who didn’t use any animals or by products in their ribbons. I was always taught good business practice is knowing what your products are made of. It was surprising to find that so many businesses had no idea whether their products were vegan or not. And I was astounded to realize that I had been one of those people. I just presumed that Faux pearls meaning fake pearls had no animal by products in. Some times I’d make progress and other times I was hitting brick walls. I was surrounded by so many good people who told me to keep going, it would work out for the best. And it did because I managed to find all of my new suppliers so I could begin making my hair accessories again. I eventually chose Swarovski pearl beads which the company assured me were cruelty free and sent me an information pack over of how they are made and what they are made of. It was a good start and so I started making my products again. However with no professional pictures and no professional photographer to help me this time round to put together the photo shoot and style it etc I had to learn photography skills as soon as possible and fast. I had so many great people around me giving me tips and I enrolled on some online courses, read everything in sight and just kept practicing. It is surprising what you can do when you are passionate about something and determined to learn. I experimented with flat lays, different backgrounds, props, and through trial and error learned what looked great and what didn’t. It is all still a work in progress and I’m no David Bailey but I finally have some pretty decent picture of my products to put onto my shop now. I used hair dressing dolls to photograph my products on and my daughter has kindly let me photograph the hair accessories in her hair. Where there is a will there is always a way I have always said. I was asked why I had decided to make my hair accessory range vegan. Up until my re brand I was a vegetarian and had been for about 8 years. I had become vegetarian purely for ethical reasons. A friend of mine sent a video over of what they do to the mollusks in order to get the pearls. See it here. I think that was a life changing moment for me and so the re-brand of my business began. Several weeks after watching another video of what is happening in the dairy & poultry industry I finally became a vegan. I knew that I couldn’t make jewellery and claim that I was making something magical when living creatures had suffered to make others feels beautiful. Was there anything magical about that? I couldn’t see anything magical at all. Here are some of the new product lines that I have made. I have just had them measured so I can send away for some boxes for them. They don’t fit into standard boxes so I am having to have them made to measure. I am just in the process on deciding on the colours of the boxes so it fits in with my branding. My logo is aqua so I am thinking about going with that colour. Although I am drawn towards white too so I’m going to take time out to think on this. These are made out of clay, the finest Swarovski crystals and Swarovski pearls which are all 100% vegan. Just got to cut the ribbon off the hair comb and then ready to go! So what have I learned from rebranding? Be patient, trust the process of life to work for you and know why you are doing it. Plus think of all of the questions that you need to ask your prospective suppliers before hand to save making costly mistakes like I did. Do you have any rebranding tips to share with me? Please share in the comments section below. I thought that I would use this blog to show you the developments in my Earth Faeries venture and also give you some tips on how to organize your event which have worked for me. These tips are applicable to organizing any event whether it is a craft stall or your wedding day. I have a craft stall in August in Whittington Shopshire UK so I’m looking forward to that. I’m being productive making products at the moment and on the look out for a new table cloth for my craft stall table. I used one with a pattern last year and it detracted from my jewellery so this time I am going for a plain one. It is not a bridal affair but a craft day so I thought I would make some fun hair accessories for both adults and children for every day wear. Here are some of the hair slides I have made so far for it. 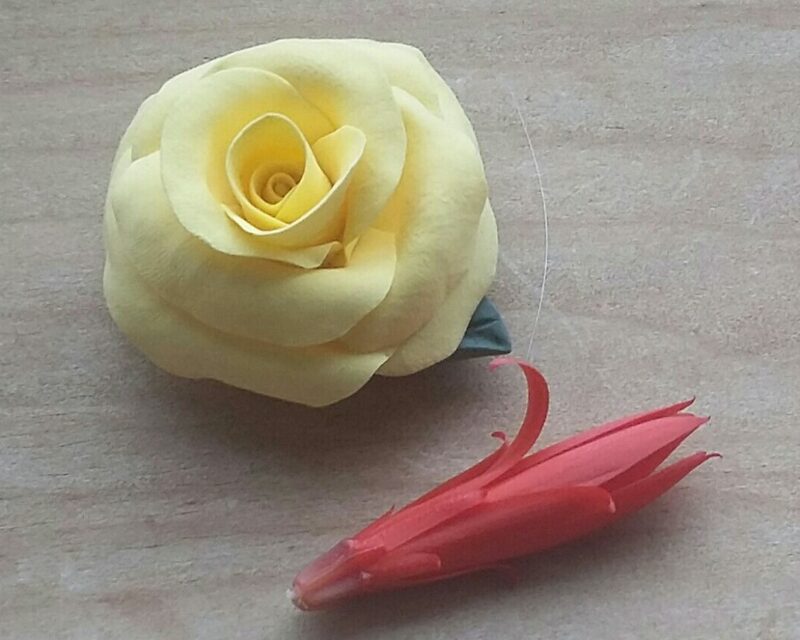 Hand sculptured rose hair slides! I thought that I would make some fun children’s hair-slides too for my craft stall. Here are some of them. I have also been working on my branding and I have had a wonderful artist draw me my first beautiful Earth Faerie character. If you follow my Earth Faeries stories on my blog then you will be familiar with my faerie characters. If not check out out my The Earth Faerie stories here. I have used this drawing in my blog and I also plan to have her made into henna tattoos and silicone moulds so I can make jewellery out of her. Here she is. Her name is Princess Onyx. I named her Princess Onyx because is the keeper of those gem stones. Not many people realize that Onyx can be black or white hence why her gemstone in her hand is white. Although her magical pet Onyx does turn both colours in the story. I received a compilation of the drawings from my artist recently showing each stage of her development which I found fascinating. Here she is being drawn. Here are 6 tips that I have used to organize my event that has helped make it stress free. Start organizing and making your inventory in plenty of time. Don’t leave it to the last minute. Order all materials well in advance so no having to rush to make things and you can then enjoy the process. Do a stock check to ensure you have all of the materials to make your products in and do it in advance just in case you have to source out new materials if they are not in stock. Get a big calendar and mark the day of your event. Stick it up on your wall as insight is in mind and there is no chance of forgetting the day! Write a to do list of all the tasks you have to completed in that time period and tick them off as you complete them. It will give you momentum and confidence to keep you going. Plus chunking your goals down in easy manageable steps helps you get so much more clarity and gives you more direction. Take some time out for yourself to meditate, go for a walk etc to relax & replenish as when you are calm you are more creative and think logically so you get things done faster! So now to finish making the rest of my products for my jewellery stall. I will post a blog telling you about it after I have attended it. Does anyone else do craft stalls? If so please tell me what you make and where your craft stall is. Or perhaps you have some tips you would like to share about organizing an event then please leave your comments in the comment box as I’d love to hear your thoughts. In this blog I’m going to show you some of the big life style changes I have been making over the past year plus give you a fantastic recipe with incredible food that your going to love. I changed my career from writing and tarot reading to making jewellery and accessories. This was a big step for me but one of the best decisions of my life as I’m in love what I do which is getting creative and getting paid for what I enjoy doing is a bonus. My top 4 tips for making any kind of changes in life is take baby steps, keep a record of your progress to build confidence and give yourself plenty of pat on backs. If you are making changes in your business then keep your customers informed and assure them that they are still going to get fantastic customer service, great products but even better products and services. If you are making life style changes for your wedding then why not team up with another bride and motivate and encourage each other each step of the way! The second step was to re-brand my jewellery and accessory business which was a major step for me. I had to source out new suppliers whilst others informed me that their products were vegan so that was a huge relief as I had already invested lots of money into my materials. I had already wrote some of Earth Faeries tales which you can find on here on my website and then discovered one of the characters names no longer fitted in with my branding. It was many months of wondering how to get round this until I had an aha moment. I changed the characters name and several other minor details and now can go forward again. So I’m sorry to all of my followers who have been reading the stories and waiting for the next chapter – I am in the middle of writing it now. Here’s one of my Earth faeries characters being drawn up. Her name is Onyx and she is the keeper of yes you guessed it – all onyx stones. She is almost ready to be painted. My designer sent her through today so it was a happy start to the day. The third change for me was to go from being a vegetarian to a vegan. I changed my branding first of all and made all of my products vegan and then my life style just followed suit. Becoming vegan was something I had always wanted to do for ethical reasons however I have a sweet tooth and didn’t know how on earth I’d get round that. And has it been easy to do? You bet it has! I have been vegan about three weeks and I am wondering why I didn’t do it sooner as my dairy free vegan food and desserts that I have been making is scrumptious and I was amazed at how much variety there is if you love cooking. I’m left wondering how on earth I never knew how many scrumptious alternative foods are out there. I must admit I have a sweet tooth and I didn’t know how I would cope with quitting chocolate. Enter Deliciously Ella the cook book that changed my life plus lots of great recipes that my daughter has been trying on me. And I haven’t looked back. My daughter has also become vegan which is good because we are getting to bounce ideas for new recipes off each other. I’d like to share this one with you that my daughter made me. It is a dairy free chocolate mouse made out of cacao and avocado’s plus lots of other awesome ingredients that are good for the body. You can’t taste the avocado’s and trust me you will be coming back for seconds. But don’t take my word for it, why not try it for yourself. This recipe has been taken from Deliciously Ella book by Ella Woodward an adapted. Add all remaining ingredients apart from the chai seeds into the food processor with 5 table spoons of water and the syrup and blend it. Put the finished mixture in four bowls and sprinkle over the chai seeds. Keep refrigerated for about three hours for it to set and then voila…enjoy! Do you have any vegan recipes to share with me? Please leave them in the comments section. 4 Tips To help you achieve your goals! In this blog I am going to look at the things, experiences and people I am grateful for. Gratitude is in my opinion one of the most magical and powerful ways to change every aspect of your life and it has certainly helped me to expand my business so I can do more of what I love – which is making more of my jewellery for fabulous customers and have more freedom to do more of what I enjoy. It is also a great way to note your progress which increases momentum and gives you the confidence to go forward. You can apply this with any of your goals including business and your wedding. For my designer Roberto drawing one of Earth Faeries Characters for me. Her name is Princess Onyx and she is the keeper of Onyx crystals. Here is a sneaky preview of her being drawn. This was the first two drafts and am waiting on the final drawing now. I’m so excited to see the final draft. She is going to be used for my stories, my stickers and other literature. Plus I’m planning on having her made into a henna tatoo and silicone moulds. They are copyrighted to me so my customers won’t be able to get her from anywhere else so they can have something totally unique. A big thank you Roberto. One of my Earth Faeries being drawn! For the professional photographer who selected me as one of the crafters to feature as part of his project. He is coming on the 15th of this month to my house to photograph me making my hair accessories. It’s my first time having anyone watch me make my inventory so I’ll keep you posted. For the encouragement I have received off my clients, their glowing reviews and for them being part of the Earth Faeries experience and helping me to create a brand they love and I love too. For my beautiful garden and the place I live in wales that is often my workshop as I sit out in my garden and in a little summer house to make my inventory. I’m also grateful for all the flowers in my garden that inspire me to make my roses. For my daughter, friends and Facebook friends for sending me all of the right contacts in order for me to re-brand and turn my business into an eco friendly one which is suitable for vegans. For my friend Natasha for telling me about the craft stall in Whittington and booking it for me so I can join her for a lovely day out in August to showcase my inventory as well as meet more fabulous people. For my friend Rik and my family for always listening to my ideas on what jewellery I am going to make next. I know I eat sleep and breath it and they always show their interest in what I’m doing and encourage me so thank you guys. I’ll try to talk about other things too! For the internet for allowing me to connect with my customers and the rich source of information on it that has really helped take my jewellery business to the next level. For the blogging community, my customers and Facebook friends for showing an interest in my blogs and for following me. For the customers who have bought my jewellery and enabled me to support the charities that I care deeply about The farmhouse Sanctuary supported by Joanna Lumley and forget me not which also provides a sanctuary for rescued farm house animals and other animals. 10% of each of the items I sell goes to these two charities. For my daughter Chelsea for paying me to make a gift for her friends birthday. It is lovely that my own family love and value what I do that they are willing to pay me for my services. These are the hand made and sculptured rose I made and customized for my customer. For my best friend Jaswant for always listening to me, encouraging me, sharing my vision for The Earth Faeries and for sending me inspirational ideas through. For the abundance of boxes that have been given to me to package my inventory in. I use either recycled or up-cycled. Thank you mum for your help, support belief in me and encouragement. I always write my gratitude diary every day. It’s an excellent way to see how far I have come and gives me the momentum to go forwards to achieve my objectives. Forget the past, learn from it and move on. You can’t change the past but you can change your future and create a better one for yourself by starting where you are now and focusing on where you want to be. Keep a daily gratitude diary so you can count your blessings no matter how small they may appear to begin with. You’ll be nicely surprised to see how little things become huge things eventually. You can use this for your weddings, your business or any other goal that you have. The power of gratitude shifts your mood and puts you on a frequency to receive lots more. It also helps you to keep track of your progress. Be mindful of what you have and the progress you are making, the people who are helping you – it really will help shift your mindset into a more resourceful stage. Be patient with yourself. You have come so far! Acknowledge this and celebrate your mile stones. Give yourself a pat on back. You deserve this as much as anyone. Know this, believe this and others will too. As they say confidence is all an inside job and it’s really working for me. Do you have any other tips you can share that have helped you go forwards in planning your wedding, expanding your business or in any other goals? Please share in the comments section. Here at the Earth Faeries in beautiful sunny Wales I am always working to make my products and packaging more eco friendly. I always say it is great wearing jewellery as it creates beautiful feelings and memories but we still have to have a planet to live on to be able to wear it. That’s why I’m always striving to use the most Eco friendly materials. I thought that I would use this blog to show you some of the new materials I have been working with and how they are good for the environment. Plus give you some interesting facts about Jute. I use acid free tissue paper, recycled and up cycled boxes and recycled business cards too. More recently I have been looking at eco friendly bags too. I finally decided to go with Jute bags as they seemed the most eco friendly option. I use glitter in my little faerie jars which not many people realize is made of plastics which didn’t sit right with me as they say. I have been on the hunt for some biodegradable ones and glitters that are compostable and have finally found them. These gorgeous glitters are 100% biodegradable. The colours are limited but the company said they will be adding to them. They have them in gold, silver, violet and pink so I bought all of the colours. They are cosmetic grade so they can also be used as nail glitter and eye shadow too. I also sent off for some cold porcelain which is more eco friendly than the polymer clay I currently work with however I am not happy with the brand I bought. It tends to crack so the search is still on. I will keep you posted when I find it! If anyone has ever worked with cold porcelain before and have a great brand that you are using then I’d be grateful if you could point me in the right direction. In today’s blog I am going to give you a look behind the scenes of The Earth Faeries. It has been a busy start to the month and apart from making jewellery for my customers I’ve been working on my branding, business cards, doing stock checks, and updating my business plan. Plus I have been learning lots! Talking of stock checks it was time to do a big order from my suppliers. It’s always a good idea to do regular orders for your materials as when you receive an order from your customers there is no waiting round for it to come through. I love when the post man comes as I’ve been receiving lots of nice packages in the mail lately. And today is no exception as two large boxes greet me. Big boxes of craft supplies always puts a smile on my face. I have a craft stall in August in Whittington in Shropshire so I’m preparing for it now. I have bought some crafting materials i.e polymer clays and a variety of beautiful black velvet jewellery display stands for necklaces earrings and bracelets. I’m just waiting for some more polmyer clays and jewellery display stands to display my choker necklaces that I have made. I have learned from my first stall where my jewellery was laid on the tables with no decorations or table cloth. And the second stall I did I had a table cloth that had so much detail on that it detracted from the jewellery. It’s a cringe moment now I know everything I do is part of my branding but it is a good learning experience. You could say my business reflects my personality so its always a good idea to make a good impression. This year I’m also equipped with a beautiful table cloth for my stand plus some table decorations to uplift anyone who views my work. I think it also makes your craft stall look so much more appealing and welcoming It certainly has been a year of learning but in a good way. I have also been investing in myself and working on my self development. My daughter bought me a Leonie Dawson business work book that has been helping me make much progress. There is so much to do when you start a business and making the jewellery is only a small part of it. There is stock checks, book keeping, creative time looking for ideas, marketing, branding, packing, craft stalls, and networking. That’s not to mention all of the time I’ve spend researching all of the online shops so I choose the right one for me. It’s looking like I’m going with Folksy which is a British company. I will keep you posted when I open my online shop. I’ve also had to find the time or as I say make the time for other things that are important to me too such as hobbies, friends and other goals etc. This book certainly has helped me and would thoroughly recommend to people who have businesses or are even planning on opening one. One of the things I have been working on this year is my logo. I think it was one of the hardest parts of the business so far. I had some ideas for example I knew I wanted a faerie and I knew I didn’t want it to be a cartoon tinker bell type one. But when it came to colors I was stumped. Choosing a logo is a lot more than going for your favorite color as it represents your whole brand and either attracts the right type of customers to you or not. So getting it right was crucial! Know who your customers are. For example what they buy, what magazines they read, what’s important to them. This will help you create the right colours, image and words to appeal to your audience not only on your business cards but on your website, in your blogs and newsletters to name but a few. Look around the internet for examples of other logos in your field to give you ideas. Give your designer as much information as possible about your business colours, your target audience i.e women getting married who have children, are 35 years young and are business owners who care about the environment. The more you know who your customers are the more you can give them what they want. Which means being able to make jewellery they love and also write articles they are interested in reading. Create a pinterest account and make some boards under the secret option and pin them with examples of others logos. This gives your designer a feel for what you want. The secret board is where you can keep your own images to look at and where other people can’t view them without your permission. I shouldn’t have worried about getting my perfect logo designed because my designer, a lovely lady by the name of Charlotte Mike Cob from F & R Designs really worked her magic wand. And so the earth faeries logo was born. Here she is. I love her. What do you think? I have just ordered some business ca rds from Moo and they have arrived today! I chose to design them myself which was relatively easy as the lay out is all there and all you have to do is upload your pictures and logo as well as write your text. I went with Moo as they have something called printfinity which means that you can upload up to 50 product pictures on the back of your cards. Meaning I have a nice little portfolio to give to my prospective customers when I hand them my business card. I ordered the green version of cards which are 100% recycled from sustainable forests and come in a lovely recycled pulp box to fit in with my ethics. They are also hand packed meaning no machinery so they are good for the environment. Although I love all aspects of my business I think that my most enjoyable parts of it apart from making the jewellery is photographing it in my own garden and doing wedding shoots. Doing the wedding shoots means I get to see behind the scenes actions on the photo shoot which is interesting and fun. Plus I meet lots of lovely business and creative people in the process. I love being outside in nature and some of the professional wedding shoots I have collaborated in have been in beautiful locations which have really helped raise my vibration. I believe that a persons energy goes into the products they make so the more happier, creative and inspired I am the more my jewellery is beneficial to my customers. As I say it is nice to pass feel good energy onto others. I even got to have a beautiful horse on one of wedding shoots courtesy of my friend and neighbor Sharon Roberts owner of http://www.penyfedwcottage.co.uk where we had the photography wedding shoot. What’s the most enjoyable part of your business? It has been quite a while since I wrote my last blog because I have had writers block & repetitive strain injury. Not a nice words I know and something I’ve never been able to understand as have never had it until now. Plus more recently I have also been nursing my little furry friend (my cat Mr D) back to full health so took a break from writing. However I am back now feeling as creative as ever and note to self to slow down! Despite not updating my blog there has still been a lot going on behind the scenes of The Earth Faeries from booking craft stalls to improving my photography skills, servicing my clients and having my new logo designed to name but a few. I have been playing around with different types of back grounds to display my jewellery. I’m very close to opening my online shop ( it’s a choice between Folksy or The Craft Stall Collective) and regardless of which one I choose I need lots of pictures. That’s okay if you are a professional photographer but I’m not so its been a huge learning curve and I’m still learning. Nether the less it has been a fun & magical experience. I thought I would use this blog to show you some of the unusual places or things I’ve used to photograph my jewellery. Some of them I have tried and some I still have to try. I found a piece of cut off wood in garden shed for this picture. My other house mate always uses them to photograph his art work so I thought I’d give it a try. I ordered some silver glitter craft felt to make another product and used the back of it to photograph this. I loved the way there was little pieces of glitter in the felt but not many so it didn’t detract from the jewellery. This shot of my jewellery was taken on a sun dial by Philip Antrobus who is a professional photographer. I’ve collaborated with Philip on several projects and he has a wealth of ideas for great places to display items. Here’s a another photograph he did for a wedding shoot I was show casing my collection in. The wellies featured Ann Dibs beautiful handmade bridal bouquet. We wanted a Welsh countryside theme as that’s where my handmade jewellery is created hence the garden and the wellies. If you are avid photography fan or have a business yourself what have you used to display your jewellery or other products on? Who is Lean Green Father Christmas? In this article I’m going to look at the fascinating history of Father Christmas, and how the father Christmas we know and have to come love has changed over the centuries. We all love him! That jolly man who fly’s around the world delivering fantastic presents to all of the children. I remember being in my grandmother’s house, huddled underneath the bed clothes as it was snowing outside and determined to stay awake so I could catch a glimpse of Father Christmas. And although I didn’t see him I heard the sledges bells outside and I was out of bed in a split second peering through the curtains, my 7 year old face pressed against the window pain. I did see reindeer’s flying in the sky but no father Christmas or was that an over active child’s imagination? Who knows but it was a lovely memory that I like to hold onto. I must of sat at the window for about an hour and finally sleepy eyed I returned to my bed and was fast asleep. Needless to say I never saw him coming into my room to put the presents at the end of my bed and a stocking full of nuts, tangerines and other goodies. But I remember smiling to myself the next day as I checked the mince pies and the glass of whisky we had left him which had been ate and drank. I always wondered though how he got down the chimney from consuming all those lovely gifts everyone always leaves him but my mum could never answer that. We know him as Santa Claus, Kris Cringle, St Nicholas. We associate him as a kind cheerful large man with white hair and beard plus red and white clothing. Although the Santas in American stores are not always depicted that way. However, did you realize the original father Christmas was dressed in green, had pagan roots and represented nature and good health. Earlier pictures depict him as lean. Fast forward and we are presented with a man who has changed his coloring of his clothes to red and too many mince pies and drink has caused his waste line to expand and as far removed as health as can be. How on earth could this happen? In the 1920’s a certain American soft drink company whose products are ladled with sugar decided Santa should be dressed in red as part of a marketing campaign that has stuck. It makes you realize how powerful marketing can be when it can literally rewrite history and not necessarily for the better. The healthier green lean Father Christmas represented spring and wore a green hooded cloak and a wreath of holly, ivy or mistletoe and had the ability to make people happier during winter months. I much prefer the green Santa as he fits in with what myself and my company stand for..being more eco friendly and looking after myself so I have the health and energy to build this new venture. I’m not perfect (I do love mince pies and as they say everything in moderation) but I am always striving to be better and like to surround myself with great role models. Who do you prefer the red Father Christmas or the green one?